This might make for the ultimate bucket list. How many of these pasta dishes have you tried? Whether your taste is spaghetti, tagliatelle or soft pillows of gnocchi, everyone has their go-to pasta dish. With an abundance of Italian restaurants scattered around Sydney, we’ve done the hard yards and sussed out 12 must-try pasta dishes. Buon appetito! 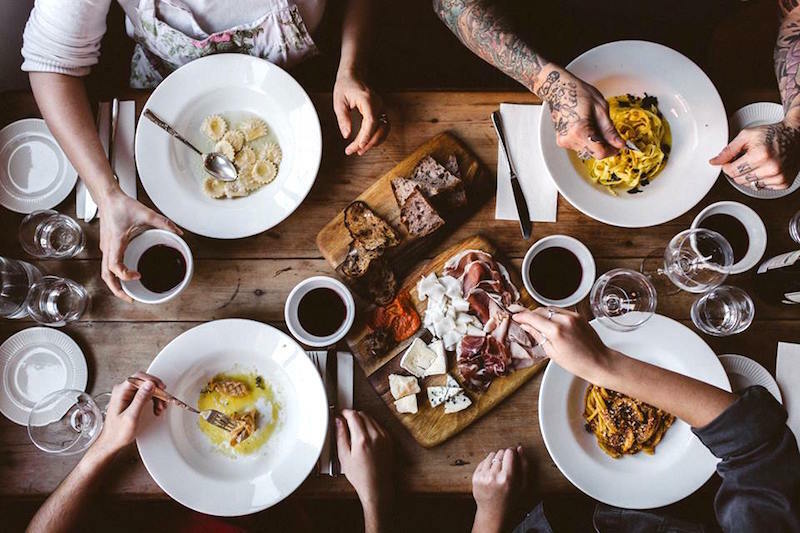 With the menu scribbled on butchers paper, you know you’re opting into an authentically Italian dining experience. Although there are many delectable dishes at this Surry Hills eatery, the spaghetti alle vongole is a prized favourite. Here, simplicity reigns above all with spaghetti, clams, chilli and olive oil making up the crux of this winning dish. Lovers of handmade pasta have flocked to Pasta Emilia since they first opened their doors back in 2012. For a decadent experience, be sure to order the duck and truffle tortelli. It might be rich, but it’s worth every. single. calorie. Lamb ragu with fettucinni is a dish you’ll find on many good Italian restaurant menus. Whilst plenty Sydney eateries do the dish well, A Tavola take the humble classic to new heights. Complex, flavoursome and rich, it’s a dish that should be on every pasta lover’s bucket list. Over the past few years Sydney has grown an impressive portfolio of plant-based restaurants, the latest addition to the family is Alibi – a grand new eatery inside designer hotel Ovolo Woolloomooloo. Those well accustomed to cacio e pepe know that it typically includes a lavish amount of cheese interwoven with pepper and spaghetti. Alibi offer an innovative rendition, using totally plant based ingredients. Raw kelp noodles are made deliciously creamy with cashews, rather than cheese – this is definitely a dish worth trying for vegans and carnivores alike. We eat with our eyes and when a plate of squid ink pasta arrives to the table, you’ll hear often collective ‘wow’s leaving the diner’s lips. With outposts in Surry Hills and the Tramsheds, Flour Eggs Water’s signature squid ink ravioli comes with salmon, vodka, chives, dill and fennel. Vodka in a pasta dish, you ask? It’s a winning flavour combination, rest assured. Lucio’s is an institution, established in Paddington in 1983. Lovers of Italian cuisine travel from far and wide to dine at Lucio’s for the tagliolini alla granseola. Visually striking, fine green noodles are laced with melt-in-your-mouth blue swimmer crab and a light tomato sauce. If you haven’t dined at Lucio’s before, this dish is certainly worth the visit. You might already be familiar with the Insta-famous parmesan wheel pasta, Chester White Cured Diner drawing this dish directly into the limelight. Sure, you can go for the cured meats selection or lamb shoulder, but the real star of the show is the Truffle Cacio e Pepe ($23). It’s a simple but effective formula – spaghetti, salt and pepper, parsley and black truffles, served out of a Sardinian truffled pecorino cheese wheel. With the waves crashing in the background, Pilu offers the perfect setting for a lavish pasta experience. It’s hard to go wrong on this menu, with an impeccable array of pasta options. That being said, the ricotta ravioli is a prized favourite. Not only can you find it on the degustation menu, but it’s also available from the a la carte offering. This contemporary Sicilian restaurant situated in the heart of Kensington Street knows good pasta. Chef Lino Sauro has brought to the table many of his family’s prized recipes directly from Sicily, satisfying diners since the restaurant’s doors first opened in 2017. For the seafood lovers, opt for the spaghetti with live marron, chilli and fresh tomato. 10 William Street is another Italian institution, serving up an array of comforting classics and contemporary dishes. With many winning meals on the menu, you’ll be hard pressed to choose just one! For those needing a little guidance, order the tagliatelle. It comes with octopus, chilli butter and olives and is downright delicious. Serving up a fresh interpretation of the traditional flavours of Tuscany is Balla. Situated inside The Star, Executive Chef Gabriele Taddeucci’s love for the traditional regional Italy translates directly onto the plate. Dive into the pasta menu and order the potato gnocchi with rabbit ragù, cavolo nero and montasio ($25). Generous in size and high in comfort factor, you won’t leave disappointed. This Paddington café and food store only came onto the pasta scene fairly recently, but they’ve been causing a stir amongst locals. You’ll find the full list of classics on the menu, from hearty lasagna to spaghetti and ravioli. A stand out on the menu is the spinach and ricotta ravioli. Served with lashings of burnt butter sage sauce, all you need is a glass of vino!